Your plants will need to be grown in some kind of cannabis or container. Large plastic pots (like the ones bushes come in) work best. Fill the bottom inch with large gravel to help drainage. And the rest with high quality potting soil with some sand mixed in. Buckets can also be used but drill drainage holes in the bottom. If your containers previously held other plants then they must be sterilized with bleach or alcohol. Since there is no sun in your closet you will have to provide a sun loving plant like cannabis with alot of artificial light. There are three options available to the grower: flourescent lights are cheap, efficient, and don't put out much heat. Metal halide, or MH bulbs, are more expensive but put out much more light than flourescents. They also put out more heat so ventilation is needed. MH bulbs also require a separate ballst in order to work. High Pressure Sodium lamps, or HPS, put out as much light as MH lamps but with a little less heat. Ventilation and a separate ballast are also required. Flourescent lights are the cheapest light to use. They run at about $2 a tube. They produce little heat so ventilation may not be needed unless the space is very small. The light spectrum put out by these lights is suitable for all stages of growing. Because flourescents disperse light over a large area, they need to be kept within three inches of the tops for the plants to receive enough light. This means you will have to mount the lights in a way that the can be raised everyday. Metal halide lamps put out the most light. They also produce alot of heat. A strong fan is needed to keep room tempertures down. MH lamps put out light mostly in the blue spectrum. Blue light is used best by the plant during vegative growth. MH lights can also be used for flowering with no adverse effects. A separate ballast is required for these lights to work. They come in sizes from 40 to 1000W. One 1000W lamp will provide enough light in a closet to grow four plants. High pressure sodium lamps put out almost as much light as MH and with less heat. Good ventilation is still required though. HPS lamps produce light in mostly the red and orange end of the spectrum. The plants uses this light best when flowering. HPS lamps can also be used for vegative growth with little slow down in foliage production. HPS lamps require a separate ballast for operation. The humidity in the enviroment is the amount of water vapor present in the air. Most growers know that humidity in excess of 85% percent increases the probability of the appearance of bud mold. The humidity is also critical during germanation when the seedlings are extremely fragile. Humidty should be kept over 80% at this stage in the plants life to prevent the soil from drying too fast. Experimentation has shown that a relative humidity of 65% to 80% increases growth rate. Below this level the plants develop extremely narrow and tissue paper thin leaves to try to prevent excess loss of water. Above 80% relative humidity the plant have trouble disposing of toxic chemicals through evaporation. Cannabis can survive tempertures from 32 degrees F to over 100 degrees F. Cannabis will grow best with a temperture of 70 to 75 degrees F day and night. Higher than 90 degrees F the enzymes within the plant begin to breakdown and photosynthesis is affected. The same is true for low tempertures. Carbon dioxide is a gas that is essential for the light reactions in all plants that carry on photosynthesis. CO2 is absorbed through the leafs stomates and is combined with water and light energy to form glucose (used by the plant as energy) and oxygen (which is released). Therefore supplementing CO2 to the existing amount in the air will speed up photosynthesis and therefore, growth will occur faster. Experimentation has also shown that CO2 can help cannabistoloerate higher tempertures (up to 95 degrees F) with little affect on the rate of photosynthesis. Although only a small portion of water absorbed by the plant is used in photosynthesis a shortage of water does affect the rate photosynthesis occurs. This happens because when the plant is low on water the stomates on the leaves close preventin the release of waste gases and other toxic chemicals. This closure will severely slow down or even stop photosynthesis from occuring. Sea of green, or SOG, is the theory of harvesting many small plants frequently, instead of large plants less frequently. In an SOG setup the closet is divided into two light tight spaces. In the top space the lights are permanently set on a 12/12 light/dark timer. On the bottom the lights are kept on for 18 hours per day. Flourescent lights are used throughout. The bottom shelf is used to start seedlings and root clones. 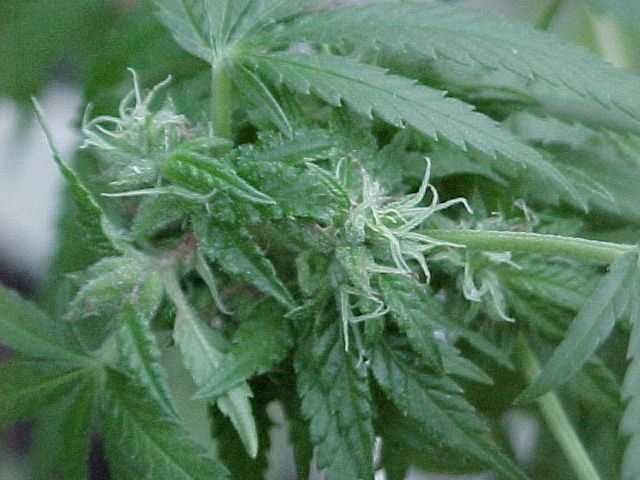 The top shelf is used for flowering. Using this setup harvesting can take place once a month. Cannabis like all other plants puts out waste through the stomata on it's leaves. Outdoors wind, rain and sun are present to evaporate these toxins from the leaf surface. Indoors the grower must create an enviroment. The best way to do this is with a fan of some kind. If the grow room is large enough then an regualar cooling fan can be placed inside and left on all the time. If you are running a small closet operation then just opening the door twice a day to look at them will create enough air movement for healthy growth. A fan controlled by a thermostat will also work well. These can be found at most electronics stores. If a large number of plants are to be kept a dehumidifier may be needed. If humidity levels are too high then the chances of mold will dramaticly increase. A dehumidifier will cost a grower about $100 so it isn,t really practical for the closet grower. Some growers add C02 to their grow rooms to increase growth rate. This has proved itself to be effective in many experiments. C02 supplementation also helps the plants withstand higher tempertures of up to 95 degrees without slowing down growth. There have been complaints however, that C02 supplementation during flowering reduces potency. Therefore, C02 should be stopped when the lights are turned to 12/12. If you do want to pollenate some females to produce seed for the next crop it can be done so that only a few buds are pollenated and the rest remain as sinsemilla. First collect pollen from a male. The male should show desirable characteristics, like fast growth, potency and resistence to pest and mold. To collect the pollen just shake the branches into a plactic bag. Black paper can also be used to collect pollen. Just lie it on the floor around the plant, in a few days the paper will have quite a bit of pollen on it. The pollen can be stored in film canisters until it is needed. When needed, use a paintbrush to brush on the pollen to the LOWER branches of the female. The best way to be sure that all the seeds are mature before harvest is to just never harvest the pollenated branches. Let them die naturally so you can be sure they produce viable seed.